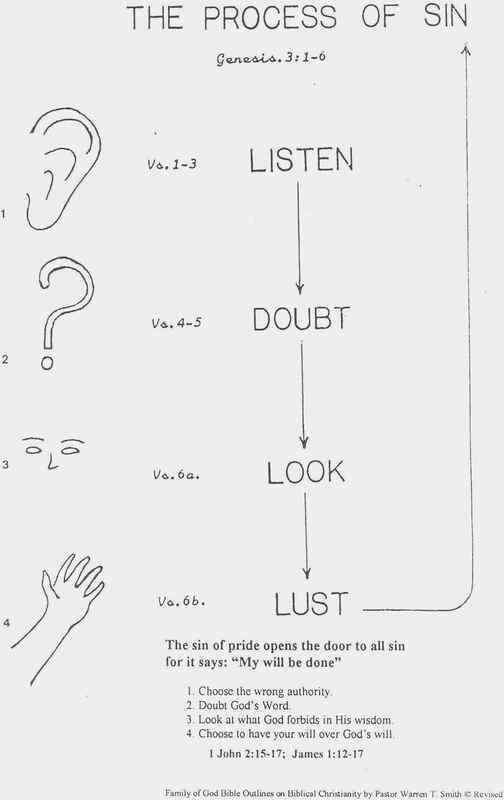 A further look, at the motive and methods of Satan's attacks on the believer. Syllabus for Understanding Spiritual Warfare. Discover where your greatest battle is going on, and how to deal with it. The armor we are to put on. Review and think through the birth of a soul. Notice the natural man does not have the spirit of God in him, therefore he is under the control of Satan. 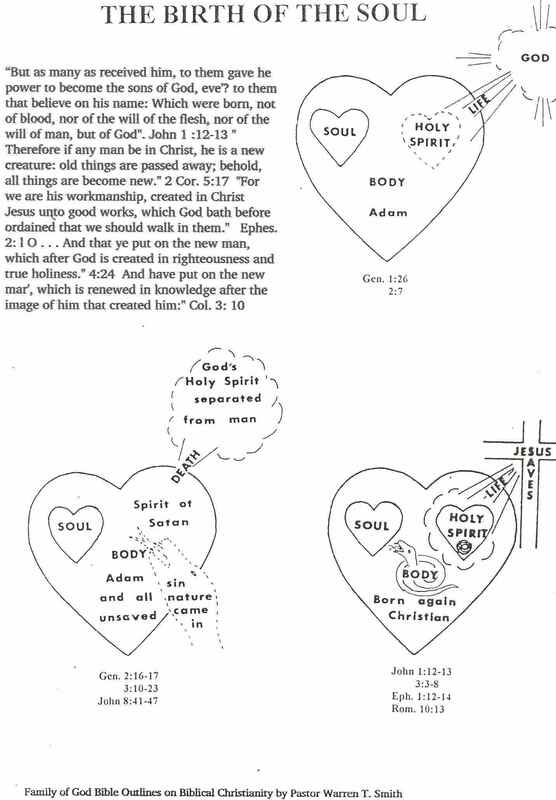 Also note that the born again Christian still has the sin nature, though he has received the Holy Spirit, the sin nature opposes the work of the Holy Spirit in his life. The sin nature is spoken of as the flesh, in which it abides. Now let's look at the Spiritual Warfare going on in every born-again person in Christ. SPIRITUAL WARFARE AND VICTORY IN JESUS CHRIST To understand our spiritual warfare we must keep in mind we were by nature part of Satan's family until we were saved and born again into God's family. From which time our warfare began, and will extend to the time that we exchange our mortal body for a glorified one. Notice: Satan is our personal enemy, his warfare is in the spiritual realm, not the physical, enlisting all his demonic forces against us. Therefore, we must be strong in the Lord and use spiritual weapons against him, that we might stand in victory and not fall in defeat. Let us look at his points of attack before we consider the armor of God for our defense. Satan knows and attacks our weak points, and those that bring discouragement. So that we will break our commitment to Christ. Keep in mind Satan's agenda ultimate goal has not changed he is bent on removing your faith in the Lord and the Word of God. 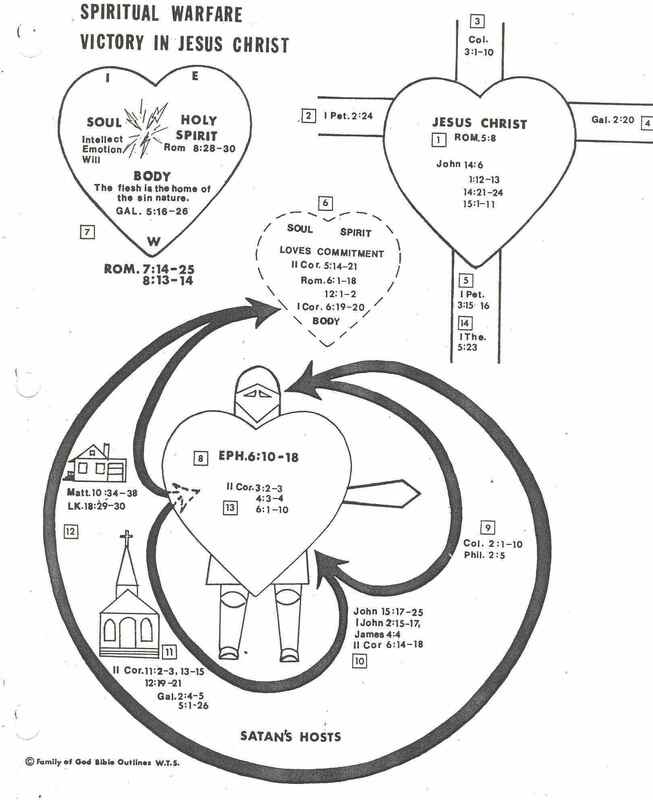 Remember method of operation is always the same, review "The process of sin"
These are all attacks from the outside but the next two areas of attack is where Satan tries to get under our armor, inside where it hurts most. First of all we are to put on all the armor or we will be vulnerable, open to the attack of Satan. Consider: 2 Cor. 10:4; Rev.1:16, 2:12, 16. Jesus is closer than a brother, He will never forsake you, but will help you. Having faith in Him will bring you through to the victory He attained for you. Self test: on Understanding Spiritual Warfare. Q1. When does spiritual warfare start and when does it end? Q2. What determines your victory? Q3. What steps must you take to assure victory? Q4. Where are you presently being attack most by Satan? Q5. Is there a benefit from spiritual warfare? You are now ready to study Unit 13 Victory Temptation and sin. Investigate the Scriptures. Christian Alerts and monthly articles. Informative Topics bring knowledge and understanding.